Captain Hemant Joshi is a retired naval officer. He lives alone, tending to his garden where he is growing a pumpkin for a competition. 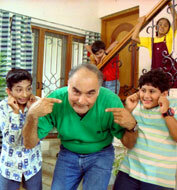 He dislikes noisy children so hates it when his 12-year-old nephew Saurab comes to stay with him. Saurab too is lonely till he befriends Chitki, Dilkhush and Pappu. Together the kids explores communication through Morse code. When the Captain’s gold medal goes missing, he blames the kids and bans Saurab’s three friends. The kids use Morse code to communicate while attempting to trace the medal. Meanwhile the captain’s archrival steals his prized pumpkin. It is now up to the kids to take over, recover the pumpkin and bring cheer to the depressed captain. Jayashree debuted as a director with the film ‘Kaat Kaat Kad Kaddu’ for CFSI and followed it up by co-directing ‘Chota Sipahi’. Besides writing and directing TV programs, she also teaches direction and acting at FTII.